Floodplain management is the implementation of preventative or corrective measures taken by a community to reduce the impacts of flood damage. This can include emergency preparedness plans, construction of flood control structures, or regulations that guide communities toward responsible building inside and near the floodplain. One Hundred Year Flood - The one hundred-year flood, also called the base flood, is the flood that has a one percent chance of being equaled or exceeded in any given year. Base Flood Elevation (BFE) - BFE is the elevation at which a structure is required to be built to in order to reduce chance of flooding. Floodplain - A floodplain is any land susceptible to being inundated by water. 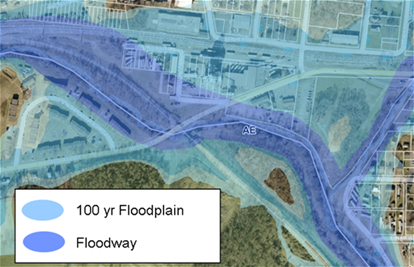 Floodway - A floodway is a channel of a river or other watercourse and adjacent land that must be reserved in order to pass the 100-year flood without increasing the elevation more than a designated height. Flood Insurance Rate Map (FIRM) - The FIRM is designed to illustrate special flood hazard areas, e.g., the limits of the floodway, floodplain, and 100-year flood. Flood Insurance Study (FIS) - The FIS provides detailed information for a watercourse that has had a detailed study performed on it. Your local flood insurance study can provide base flood elevations. Substantial Improvement - Any reconstruction, rehabilitation, addition, or other improvement of a structure, the cost of which equals or exceeds 50 percent of the market value of the structure before the start of construction of the improvement. Protecting individuals from buying land and structures which are unsuitable for their intended purpose because of flood hazards. An Elevation Certificate is a document that provides information necessary to verify that the building is in compliance with local floodplain management ordinances and aids in the proper evaluation of an insurance premium. The elevation certificate also can be used to support a request for a Letter of Map Amendment (LOMA), Letter of Map Revision (LOMR), or Letter of Map Revision Based on Fill (LOMR-F). In the Town of Vinton, elevation certificates are required when submitting plans for a new structure, or a substantial improvement to an existing structure. New or substantially improved residential structures are required to be elevated at least 2 feet above the base flood. New or substantially improved non-residential structures are required to be elevated at least 1 foot above the base flood. For new structures, an as-built elevation certificate is required to be submitted upon completion of construction to ensure that the building was elevated to the required height.